If you or anyone you care about has Autism Spectrum Disorder, your know how crucial public awareness is to understanding and acceptance. 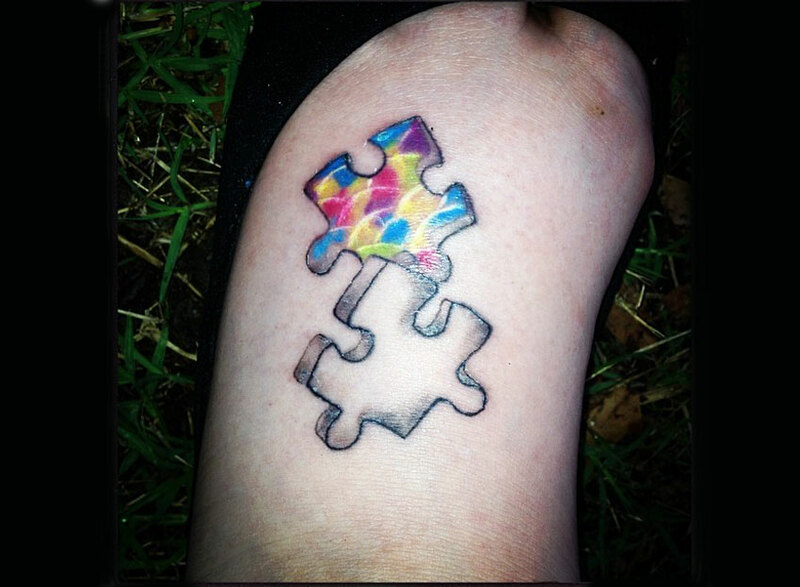 An autism awareness "puzzle" tattoo telegraphs your concern and invites questions and conversations about the condition. 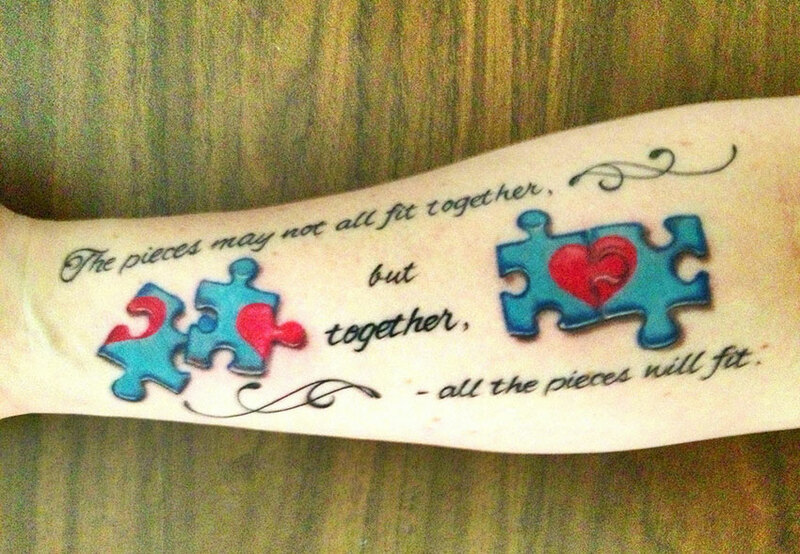 The puzzle symbolizes both the fragmented behaviors of ASD and the goal of putting those pieces together. Autism's neurodevelopment disorders interfere with fluid behavior, social communication and interaction. A person with autism can seem like someone interrupted, a disconnected set of responses or silences. However, fitting separate behaviors into a normal pattern creates coherence. Love makes the pieces fit. What better message for the inside of your arm? It takes a brave heart and strong wings to soar above daily frustrations and setbacks, value every person and every effort toward progress and achieving milestones, and see how the bright light of awareness is a beacon of hope. 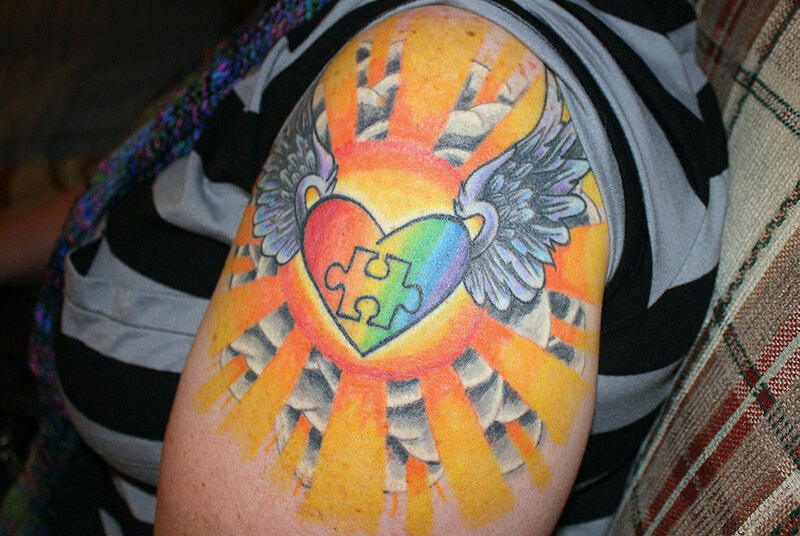 A winged heart against the sun, and a rainbow for the spectrum of autism symptoms, show your courage and caring. Simple and direct are not only approaches to life, but also learning and coping skills that work for many people with ASD. Shadowed 3-D puzzle pieces scattered across the top of your foot may remind you of how far you or a loved one has come in conquering the challenges of the condition. The plain pieces are a personal marker but may also spark conversations that lead to greater acceptance. Primary colors and tiny handprints tell the story of ASD in a child's world. ASD kids are all over the spectrum, from mildly to severely affected. Increase public awareness, early identification, and even recognition of risk factors with a symbolic ribbon, crayon-box colors, and "poster-paint" handprints on the rounded swell of a calf or your upper arm. Tell the whole story in words, images and symbols that may answer as many questions as your unusual tat inspires. Two human hands forming a heart-frame around a completed heart puzzle - all the colorful pieces together create the heart - grab attention and point directly to the unmistakable message. "Autism," in bold, beautiful script, couldn't be clearer. The simple words below it are the call to action: Support; Educate; Advocate; Love. Your tat begins and ends with love. Perfect. 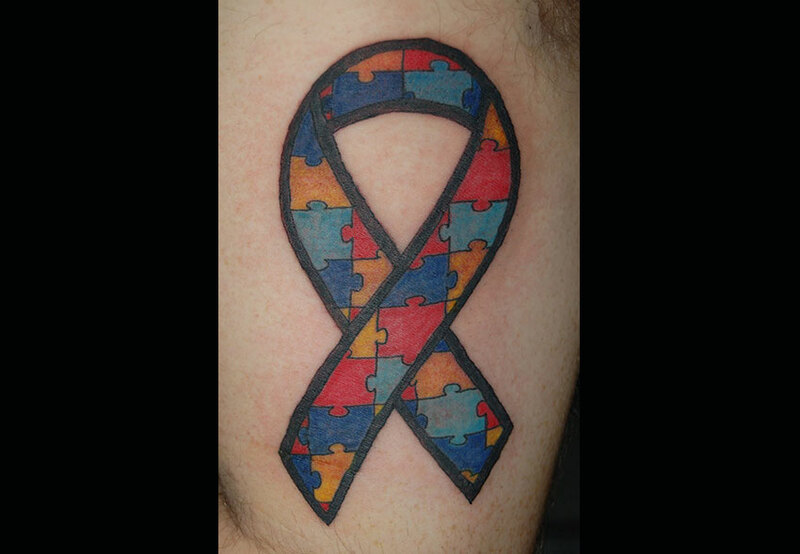 A brightly colored puzzle ribbon is an icon of awareness. 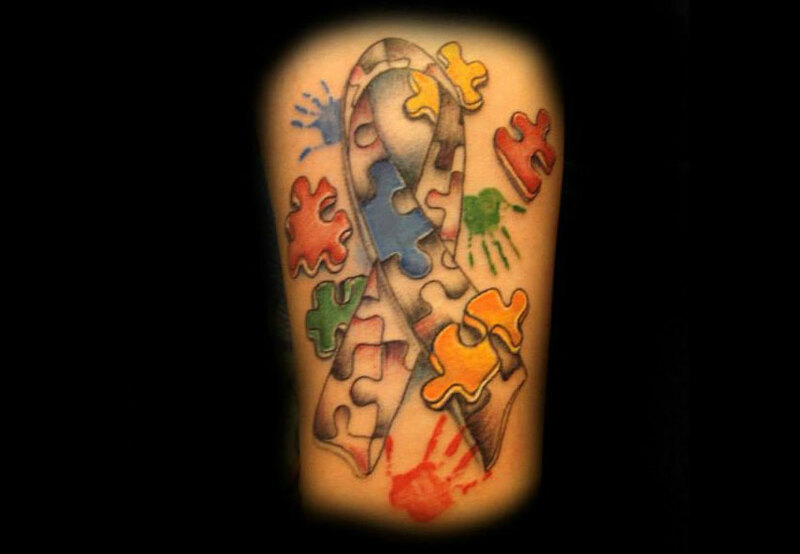 In this case, the ribbon recalls the autism spectrum, the wide range of symptoms, and the asymmetrical development that is a characteristic of ASD. Note the different lengths of the ribbon ends and ask that your tattoo artist include those uneven, or asymmetrical, ends when inking your awareness ribbon tat on your skin. There is no "cure" at present for an Autism Spectrum Disorder. 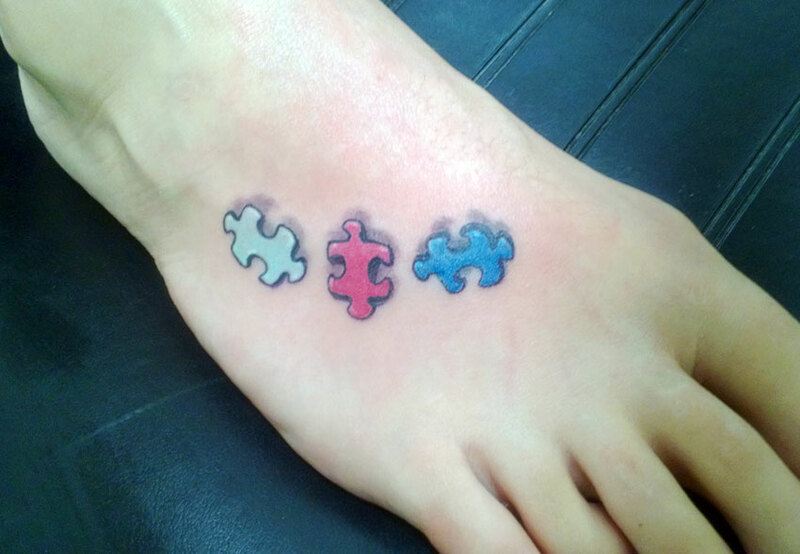 As long as the complex of set of symptoms that define the condition remains a puzzling challenge, a puzzle tattoo is a ready symbol of advocacy for those with ASD.